Tim Burton Courted For MONSTERPOCALYPSE Movie!! But Will There Be VOLTRON?? Mike Fleming says Dreamworks is in extremely early discussions with Tim Burton about developing a film based on the Privateer Press miniatures game MONSTERPOCALYPSE (site HERE). 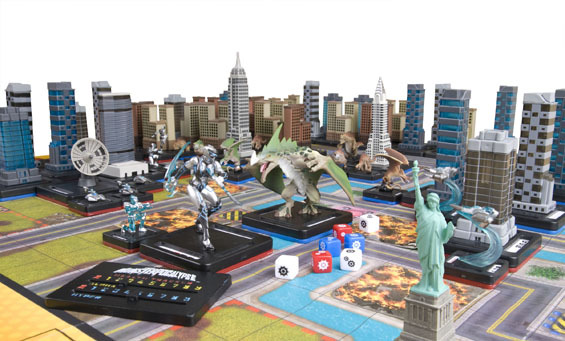 Monsterpocalypse is a kaiju-themed collectible miniatures game. It's a board game that involves battles against a variety of enemy monsters that take place in a metropolis filled with buildings. ..says Deadline HERE Interestingly, the MONSTERPOCALYPSE universe also encompasses VOLTRON (details HERE). No word on whether DreamWorks' acquisition of MONSTERPOCALYPSE would actually give them the rights to use VOLTRON designs/characters in the film (my guess is it would not), but the notion is...interesting. For a further sense of the design/breadth of this game, take a look at the components that can be found HERE .